Figure 2-1 shows the three levels of folders. The Asset catalog folder contains all the folders and files for one asset catalog. Group folders contain asset folders and other group folders. Asset folders contain the files for an individual asset. Each folder can contain a .json file encoding the attributes for the catalog, group, or asset in that folder. For more information on the .json file, see Contents.json File and Table 5-2. 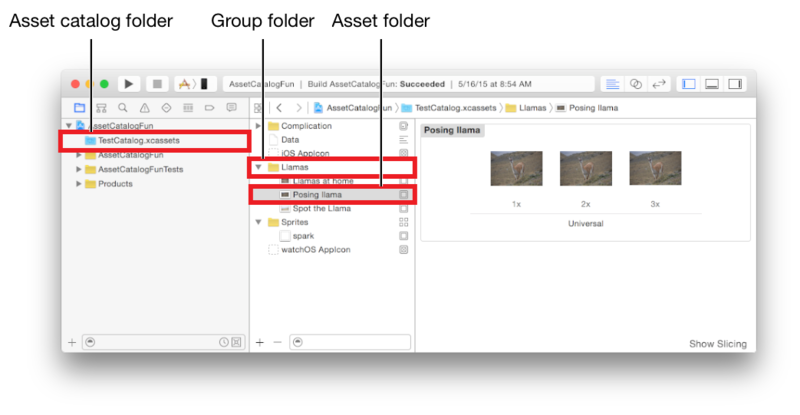 For any target in an Xcode project, the fully qualified name of an asset must be unique across all the asset catalogs and across all asset types. For example, it is an error to have an image set folder in one asset catalog called Llama.imageset and an image set with the same name in the same catalog or in a different catalog that is part of the same target. Similarly, it is an error to have both an image set folder called Llama.imageset and an app icon folder called Llama.appiconset in the same catalog or in a different catalog that is part of the same target. The full name includes the name of any group or sprite atlas folders that are marked as providing a namespace. For example, if the group folder mammals contains an image set Llama.imageset, the fully qualified name of the image set is mammals/Llama. The asset catalog folder is at the top level of the catalog. Inside the asset catalog folder is at least one asset folder. There may also be group folders.